What do the different colors mean in my Smart Schedule? Wondering why some timeslots are different colors than others? Learn what they all mean here! When you look at your Smart Schedule, you'll notice a few different colors in your weekly timeslots: A dark shade of green, a lighter shade of green, grey, as well as timeslots surrounded by a dotted green line. Have you ever wondered what they mean? Let's break down what each color represents. The darker shade of green indicates that these timeslots were added to your schedule when your Smart Schedule was generated. 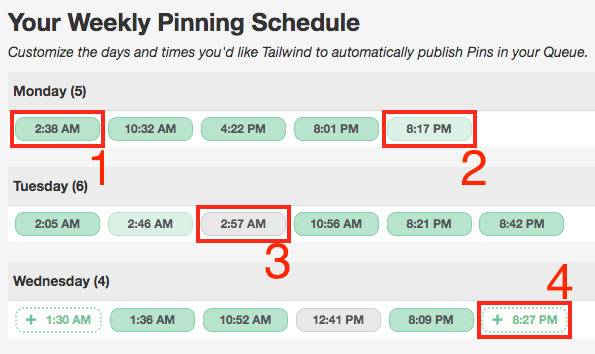 The lighter green timeslots are optimized (based on Pinterest data), and were recommended additions which you added to your schedule. Grey timeslots were added manually by you. Timeslots surrounded by the dotted green line are recommended timeslots as mentioned above - however they are yet to be added to your schedule. If you wanted to add more timeslots to your schedule, these are a good place to start! Want more information about managing your Smart Schedule? Check out our Knowledge Base article: How do I add or remove timeslots?